Forget vacationing in crowded Italy or Greece, Romania is the undiscovered gem you’re looking for. Alright, maybe don't totally forget about Italy ….. or Greece. Both countries are amazing and definitely worth some of your vacation time. But definitely don’t overlook the charming villages hiding in the country of Romania! Eastern Europe is hiding these picturesque towns and villages that have yet to make it big on Instagram, meaning you’ll get a darling vacation spot that isn’t swarming with tourists. Call the country of Romania home while you help out in an orphanage! Get info about volunteering in Romania, here. If you chat with Europeans, they’ll tell you that so much is hiding in Romania; everything from picturesque medieval towns, to towering castles, to miles of untouched mountains and lakes. We’re in love with everything there is to see in this country. One of our new favorites? This is the top spot to see in the area, a still-inhabited medieval citadel that’s made up of 14 impressive towers, 9 of which you can tour today. Parts of the citadel have been around since the 1100’s (!!) Inside the citadel, you’ll find clock tower that supports a neat museum and a stunning view from up top (and detailed figurines for each hour of the day). Plan on spending some time in the citadel to admire what’s inside, like the covered staircase — an old wooden roof cover and an even older stone staircase that will lead you up to the Joseph Haltrich High School, and the Church on the Hill. If you dare, you can also peek at the gravestones in the centuries-old cemetery. It’s the main tourist focal point of the city. Inside the citadel, there is also a weapon’s museum that’s closed on Mondays, but supports some medieval weapons and weapons of torture you can admire. See the picture of the clock tower peeking out from between colorful buildings? We knew you'd love this place! 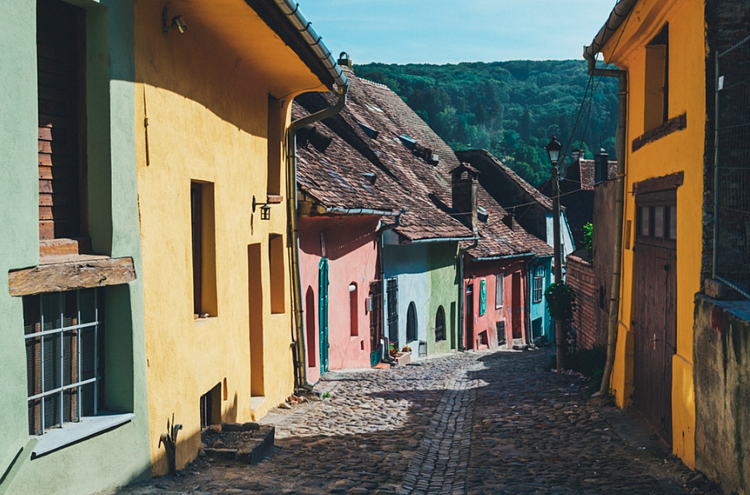 Blush pinks, pale lemon yellows, coral rimmed windows, and vivid greens are just a few of the colors you’ll find on homes, stores, and other buildings around this Romanian city. It’s almost like everyone in the entire city was assigned a handful of crayon colors to decorate with, so you’ll see pockets of pinks, blues, and oranges hiding among the dark, Gothic architecture which also dots the city. Oh, and most buildings are tiled with red tiles which just adds to over all charm. Bring your camera! The city center (Piata Cetatii) is a good starting point for wandering around; you can reach all of the city's main sites from the square. 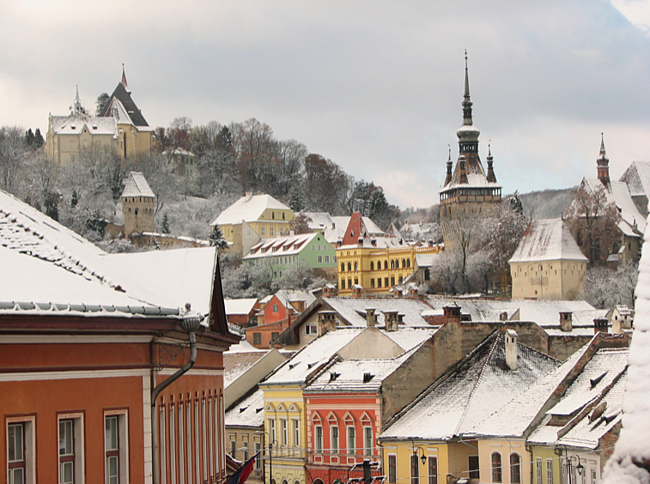 A big reason to visit the quaint Romanian town of Sighisoara are the views; you can see the entire village and churches spilling out below you if you climb up Vila Franka; It’s a hill to the south of the Clock Tower. The road up will eventually blend into a grassy field which unfolds to grand views. You can also get a rad view of the whole city below you if you climb up the Clock Tower — Do not miss this! It sports some of the best views in all of Sighśoara. 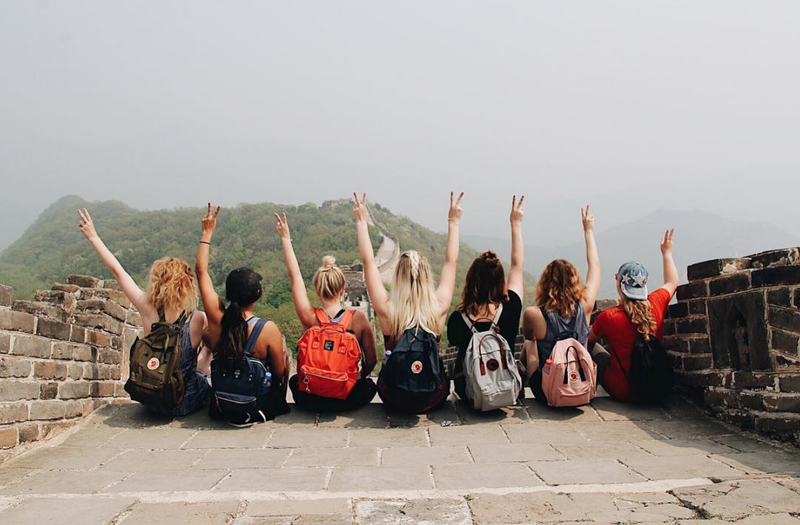 There are lots more churches, towers, and other points of interest you might want to squeeze into your itinerary. 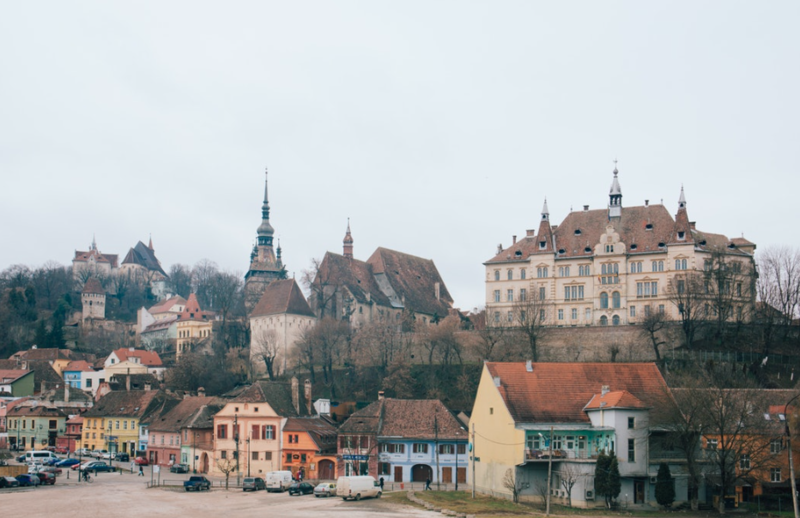 This Romanian website has great highlights in English when it comes to buildings and sites to admire in Sighśoara (which is pronounced "see - ghee - swahr - ah", by the way). The history does have something to do with Sighiśoara's overall success — Vlad Dracul II was born here, who’s son is known as Vlad The Impaler. And yes, in case you were wondering historians believe that the sir name Dracul formed the name Dracula you’re so familiar with. There may be odd memorials of that fact around the city like a bust of the ruler, but coming to this historical figure’s birthplaces is a pull for some visitors. Sighiśoara is just 2-3 hours away from Brasov, another spot that our volunteers in Romania just can’t get enough of. 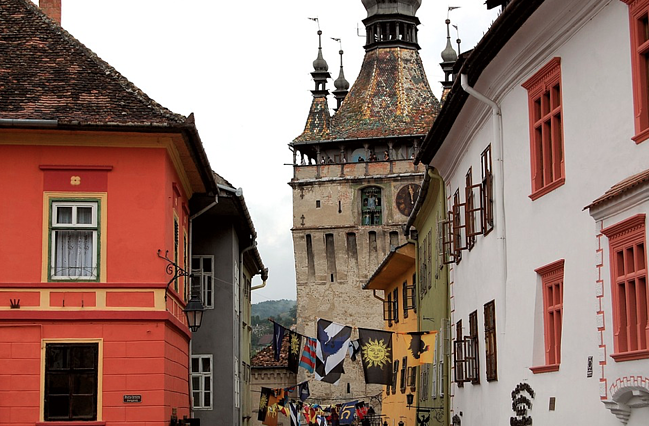 Among other things, Brasov is your jumping off point to see Bran’s Castle, more famously known as Dracula’s Castle (get our full Brasov guide here). Since the two cities are so close to each other, it makes sense to spend a few days in Brasov before hopping over to Sighiśoara. In fact, it’s such a small town that you really could treat it as a day trip from Brasov: there are regular trains and buses to take you. Trains take a bit longer (thanks to a transfer you’ll need to take) but you do have more time options. Ticket prices are also more affordable (tickets are around $5), but you can check out more train times and dates for trains to Sighiśoara. There are 8:00 AM buses (depending on the day of the week) that will get you in Sighiśoara by 10:00 AM, with $8ish dollar tickets. Look for more specific times and dates for buses to Sighiśoara here. You’ll just need a pair of solid walking shoes. The entire city of Sighiśoura is very walkable, and the best strategy is to have a full day to walk and stop at whatever catches your eye. If you want more tourist information about the city and things to do, there’s a Tourist Info booth at the town square, Piata Cetatii. Google Maps will pull up everything you’ll want to see that’s mentioned on this list. Depends on you, but the town itself is rather small, meaning you can hit all the big sites if you have a full day. We suggest getting the earliest bus or train there, and the latest bus or train back to Brasov if you’re just hitting Sighiśoara in a day. There are some kitchy-Dracula souvenirs you can find in the area, but if you wander into the International Cafe you can find beautiful, hand-carved products and captivating ceramics. If You’re Visiting In July …. See if you can time your visit with the Medieval Festival that happens in the Old Town of Sighiśoara; it’s supposedly the oldest Medieval festival around, complete with knight fighting re-enactments, poetry readings, musical numbers (era appropriate, of course), and archery, plus those dressed up in authentic costume as they sell pottery, jewelry and other crafts. The festival is very popular, so book transportation and any lodging early — the festival typically happens the last weekend in July, so the dates vary from year to year. 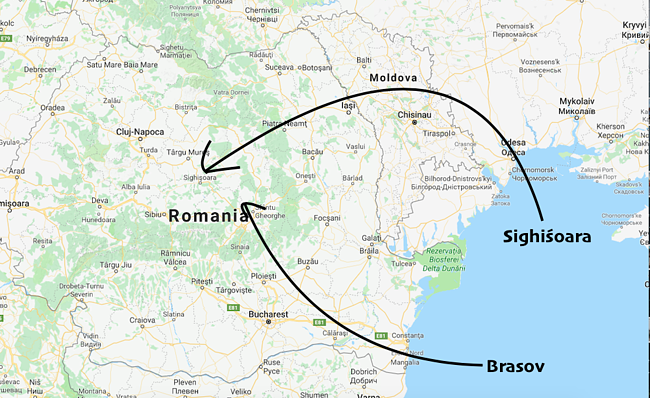 We thought so — Romania is home to about a dozen of these vacation spots that are just a train ride away from where you'll be living as an ILP volunteer. Each year, ILP (International Language Programs) sends college-aged volunteers to Romania (and a few other countries) to make a difference. In the city of Iasi, that means helping in an orphanage, plus weekends off and vacation days to see what else this country has to offer.